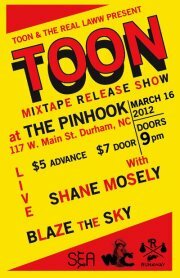 Tonight, Toon and The Real Laww will celebrate the release of Toon's anticipated Ep release. Keeping the philanthropic model of business going, the release will coincide with a custom snapback baseball cap designed by Toon and Dave Baron of SimplySea.com brand caps. 1/4 of all cap proceeds will benefit the Durham Crisis Response Center, who works with the community to end domestic and sexual violence through advocacy, education, support and prevention. Toon and his mother are both domestic abuse survivors so which is why this is the philanthropic effort connected with this release.